Audra Jennings: Get Fired Up for Mary Connealy's webcast next week! Get Fired Up for Mary Connealy's webcast next week! Best-selling author Mary Connealy will be hosting a webcast on October 8 at 8:00 PM EDT, where she will be introducing readers to her latest release, Fired Up (Bethany House Publishers / September 15, 2013 / ISBN 978-07642-0915-4 / $14.99). 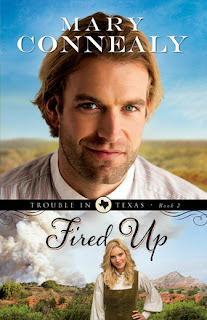 Described as a rollicking Wild West adventure and romance, Fired Up is the second book in Connealy’s Trouble in Texas series. During the live online event, Connealy will be discussing the series, previewing her upcoming releases and answering reader questions. Throughout the hour, readers will have an opportunity to chat with other fans, answer trivia about the book and submit their own questions for Connealy to answer during the evening. A number of prizes will be given away to those participating in the discussion, including copies of Connealy’s books and gift cards. At the end of the webcast, the winner of a Kindle Fire HD will be announced. The Kindle giveaway is being held in conjunction with the Fired Up blog tour being coordinated by Litfuse Publicity Group. The webcast will be hosted on Connealy’s Facebook page, as well as the Litfuse Publicity Group website for readers without a Facebook account. Leading up to the webcast, readers can RSVP for the event and sign up to receive an email reminder. From September 17-October 8, fans can also enter the contest for the Kindle Fire HD via the author’s Facebook page. Readers can keep up with Connealy via her website www.maryconnealy.com and blog http://mconnealy.blogspot.com. She is also active on Facebook (maryconnealyfanpage) and Twitter (maryconnealy). Bonded through their experiences during the Civil War, three young veterans work together to help one another build new lives after the conflict. But with opportunistic ranchers, vengeful cowboys, and three feisty women vying to have their way, you can bet there’s going to be trouble in Texas! Ruthy MacNeil nearly drowned before being rescued at the last second by Luke Stone. Now, alive but disoriented, she’s left with little choice but to stay with him—at least until they reach the nearest town. But is she in any less danger with this handsome cowboy than she would’ve been if she’d stayed on her own? Dare Riker is a doctor who saves lives. But lately, someone seems determined to end his. He wants to leave the violence of his war days behind and move on—preferably with Glynna Greer at his side. But will he survive long enough to have his chance at love? Mary Connealy writes romantic comedy with cowboys. She is a Carol Award winner and a RITA, Christy and IRCC Award Finalist. 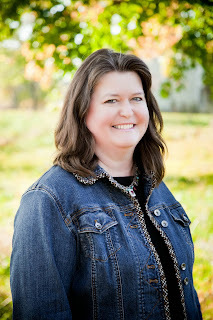 She is the author of the Trouble in Texas, Lassoed in Texas, Montana Marriages and Sophie's Daughters series, Cowboy Christmas, Black Hills Blessing, Nosy in Nebraska and was one of three contributing authors to Alaska Brides. Connealy is a contributor to the Seekerville and Pistols and Petticoats blogs. She lives on a ranch in eastern Nebraska with her husband, Ivan, and has four grown daughters.